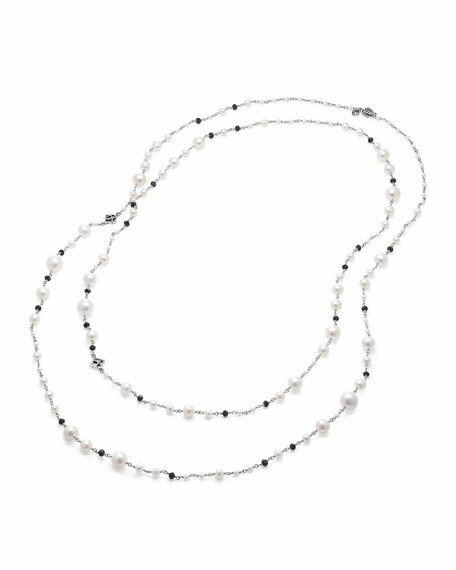 David Yurman Oceanica Beaded Link Necklace, 62"
David YurmanOceanica Beaded Link Necklace, 62"
David Yurman necklace from the Oceanica Collection. 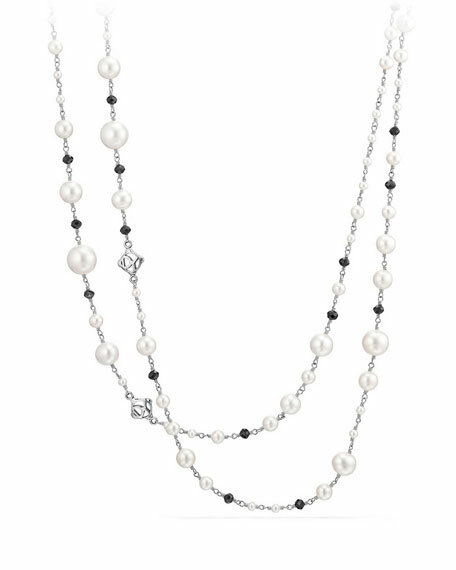 Dyed white freshwater cultured pearls, 4.5-10mm. Faceted black spinel accent beads. David Yurman necklace from the Ch??telaine?? Collection. Sterling silver. Pav?? white diamond prong settings. Faceted, linear hematine stations, 9mm (0.4"). David Yurman necklace from the Ch??telaine?? Collection. Sterling silver. Pav?? white diamond prong settings. Faceted, linear hematine stations, 9mm (0.4"). 0.55 total diamond carat weight. Push clasp. Imported. David Yurman necklace from the Continuance?? Collection. Polished sterling silver links, hardware and clasp. Naturally white freshwater cultured pearls. Ample length for multiple ways to wear. Lobster clasp. Approx. 36"L. Imported. David Yurman necklace from the DY Crossover?? Collection. Polished sterling silver chain and hardware. Interlocking rings with white diamond pav??. David Yurman necklace from the DY Crossover?? Collection. Polished sterling silver chain and hardware. Interlocking rings with white diamond pav??. Approx. 17-18"L; 21mm wide pendant. 0.28 total diamond carat weight. Lobster clasp. Made in USA.